All Friends Animal House Stabilizer from Chrisal is a probiotic spray for hygiene and odour control. All Friends Animal House Stabilizer from Chrisal has been specially developed for use between cleaning. The probiotic liquid may be sprayed lightly in each animal shelter, in order to control odours and introduce probiotics into the environment. The product is also effective against the odour of ammonia in bird cages. 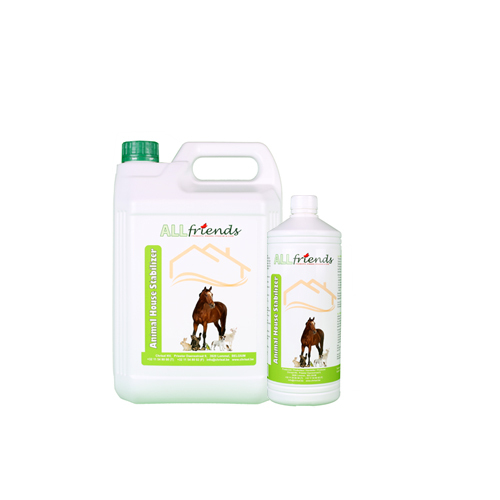 This product complements All Friends Animal House Cleaner, and spraying between cleaning maximises the effects. The probiotics ensure there are healthy microflora in the environment, reducing the risk of germs and allergens, removing dirt, and actively fighting odours. Deep cleansing: probiotics remove dirt and micro-organisms in even the smallest spaces on various surfaces. Odour control: odours are often formed by unwanted micro-organisms. These are replaced by probiotics, which produce no unpleasant odours. Safety: unlike many chemical cleaners and disinfectants, probiotic products are very safe to use. Environment: probiotics are not only 100% natural, they also contribute actively to waste water treatment, promoting the environment rather than just being environmentally friendly. There are no effective chemical substances used in probiotic cleaning, so animals cannot develop a resistance against it. Store the All Friends Animal House Stabilizer between 5 and 40degrees C, away from direct sunlight and out of reach of children. Have you used All Friends Animal House Stabilizer before? Let us know what you think about this product.